Ban Khun Mae have been in Thai restaurant business for over a decade now and they are also one of the famous Thai restaurant that visited by many locals and tourists. 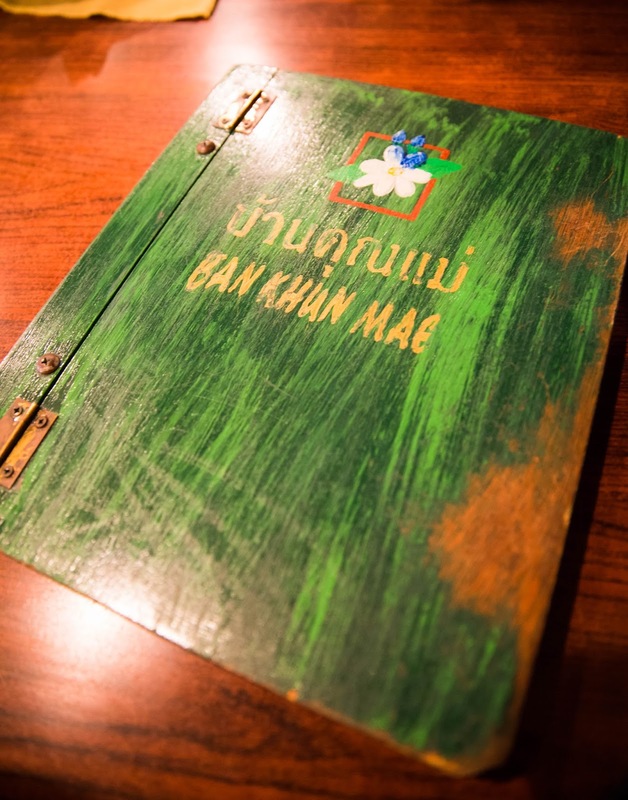 Ban Khun Mae is located at Siam Square, opposite to the famous Som Tam Nua Restaurant. I actually planned two options for dinner that night, either to visit Som Tam Nua or Ban Khun Mae which depends on the crowd. I'm not a patient person who can queue and wait for food (it is also depends on the mood), so I give ourself two options for dinner depends on the crowd. 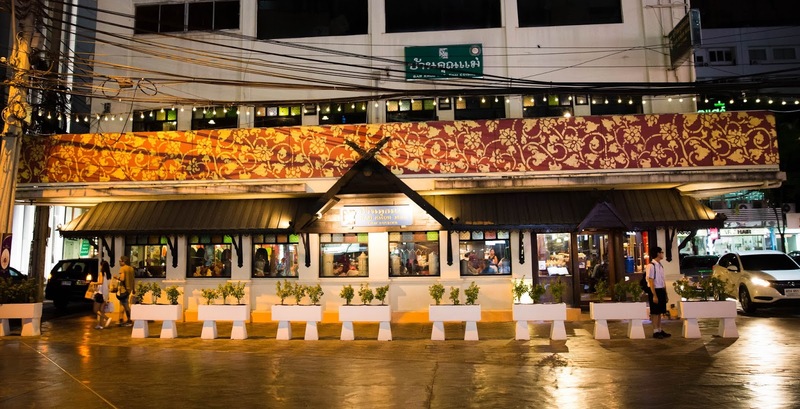 At first we planned to visit Som Tam Nua since we missed out in the last trip but the crowd are still queueing even though it is near to 9pm. It is crazy! So instead of waiting (since we are damn hungry too), we went to Ban Khun Mae, still need to wait for 15 mins but I think shorter waiting time than Som Tam Nua. You can check out some of their menu here. Coconut water needed for a hot day in Bangkok. Just remember any beverages serve in Bangkok is always sweeter than Malaysia. 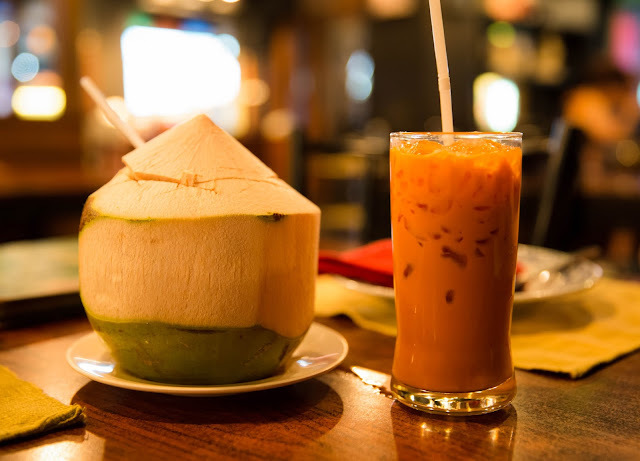 So, if you can't take too much sugar, either ask them to reduce the sugar level or order a cup plain water or coconut. 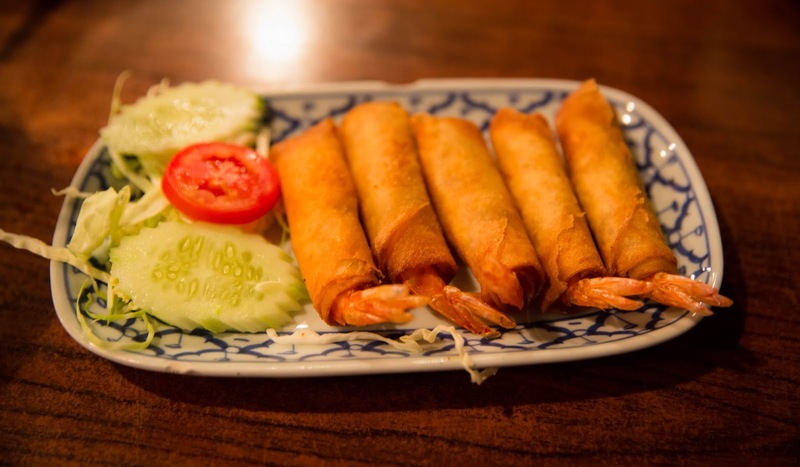 We ordered this crunchy and delicious shrimp spring roll as starter. The method they used to fried the spring roll is really good, it is not oily at all. Great for those who hates oily food. 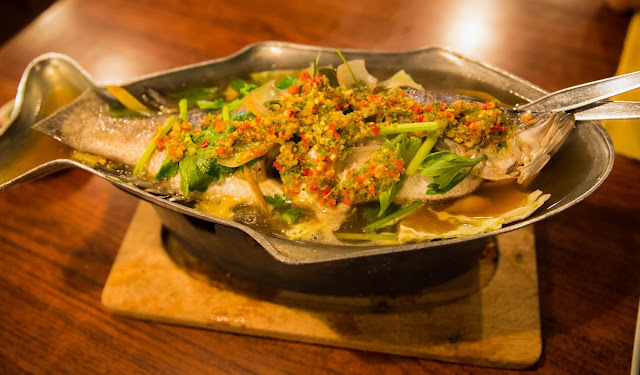 The chilli lime sauce is quite mild, we both personally love intense flavour especially comes to Thai Steamed Fish. For those who like mild flavour, this is really a recommended dish. The price is quite reasonable too, hardly can find in famous restaurants with that kind of price. I always like to order this dish when I visit Thai restaurant. 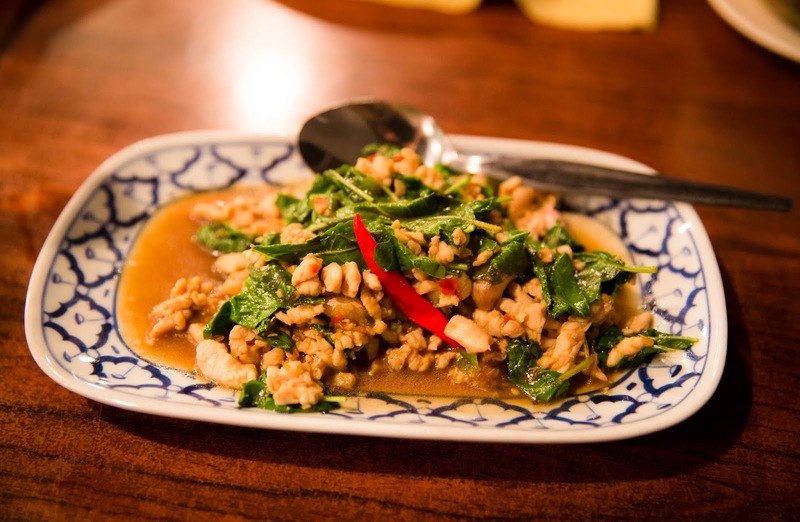 The way they cook the chicken and basil bring a special flavour into the dish. However I think this dish is lacking in basil fragrant, overall taste like normal stir fried chicken dices. 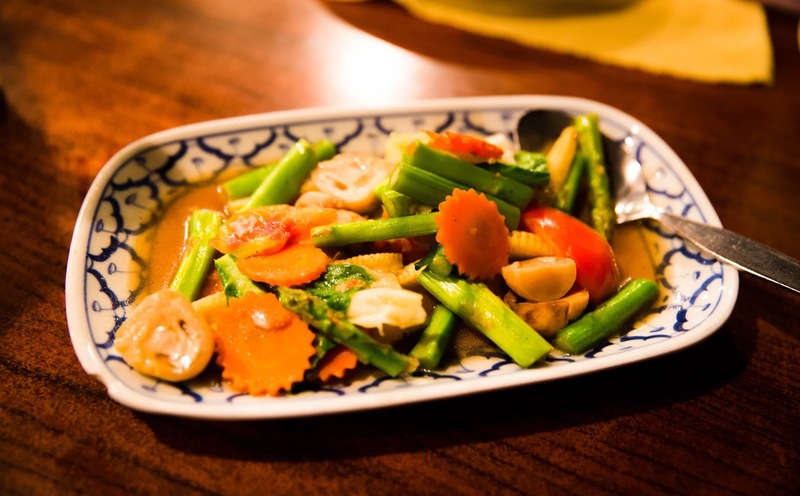 Last but not least, a plate of mixed vegetables to add some greens into our meal. Like the Chinese always said "wok hei" is important to determine how good the dish will be. I would said only 60% of "wok hei" is presented in this dish. Overall still taste not bad. I personally think that Ban Khun Mae's food quite suitable for tourists who are not comfortable to heavy flavour. Their food is quite mild in taste, suitable to those who can't take spicy food as well. The ambience of the place is cosy and nice for a family gathering, price is quite reasonable too. If you have visited the place before, comment below and share your experience with me. I love to hear from you.